The Magician card shows us King Solomon, builder of the Temple, wisest of all humans, master of magic, subduer of demons until he himself was tricked by Ashmedai (see card 15, The Devil). Though he had seven hundred wives and three hundred concubines, his true match came in the powerful and brilliant Queen of Sheba, shown on the Strength card.Thus we find strong links between the Magician, Strength, and the Devil, the first triad, which is to say the initiatory cards of the three lines of the Major Arcana (1, 8, and 15). Temple as the House of God. In mystical texts “House” sometimes means the Temple. in the Bible “God blessed Solomon with wisdom.” In the Sefer Bahir (again, see previous card), we find a reworking of the famous line from Psalm 11, “Fear [Awe] of YHVH is the beginning of wisdom.” The Bahir says “The beginning is wisdom, awe of YHVH.” Fear does not bring wisdom, wisdom leads to awe. The line is not about terror of a God who might crush you, but rather the wisdom to experience awe of the Infinite, the Eternal. Solomon’s father, David, originally wanted to build the Temple, but he had devoted too much of his life to war. David also lusted after a woman he saw bathing, and in order to satisfy his desire but avoid the sin of adultery he sent her husband to the front lines, where the poor man died in battle, leaving David to claim the widow. But Solomon, too, was flawed, for he allowed some of his wives to bring idols into the Temple. One lesson we learn from the Bible is that no human being, however wise or powerful, is flawless. As “partner” to the Shekinah, and builder of her house, Solomon the Magician channels the heavenly energy of Above to ground it Below, in the physical world. In the Waite-Smith deck and others, the Magician raises one arm holding a wand, and points the other downward, towards flowers. Here we see his right arm raised, and his left holding the staff, which grounds the energy in the Earth. bind demons (and the Djinn, in Arabic tradition) to his will. In the great lore of The Book of Raziel, Solomon is one of those who received the Book, for he used its secrets to build the Temple. Tradition and myth tell how the earthly Temple mirrors, in stone and wood, an eternal Temple in Heaven. Solomon, we learn, could travel between them. Wisdom, creative fire, and dedication unite Above and Below. demons and forced them to tell him their names, and powers, and how to control them, primarily by invoking the names of angels. The Testament (which shows clear Christian influences, if not actually of Christian origin) became the model or many later grimoires, or magical texts. In one of the encounters described in the Testament, Solomon imprisons the demon in a jar. This would later become the famous image of containing a djinni (genie) in a bottle, for in Muslim tradition Solomon, called Suleiman, masters both the djinn and the ifrits, or demons, creatures of great magical power who are sometimes described as made of smoke and fire. Divinatory meanings: Wisdom, creativity, will, magical ability, especially in service to a higher cause. Fire, vitality, life energy, the masculine principle (in women as well as men). Mastery, whether of a skill or of the self. Reversed: Arrogance, pride, misuse of power. Taken in another direction, weakness, doubt, blocked energy. With the Devil, danger of being tricked, taken advantage of, or controlled by someone else. The Raziel Tarot is a stunning presentation of significant mystical narratives bound within the tarot deck. In the precise artwork of Robert Place, Rachel Pollack has re-told the tales of spiritual ascent and glorious unification, through the lens of Judaic myth. In doing so, these cards provide us an illustrated architecture of paradise through which we may ascend and descend in our own life story through every shuffle and spread. Rachel writes that the deck deals with the “great theme” of genuine reunification and liberation; and also the Shekinah, the presence of god most often depicted as feminine. The leading Kabbalistic scholar Moshe Idel in his ‘Ascensions on High in Jewish Mysticism’ explores the process of reunification through spiritual ascent and this deck provides us a means of realising that ascent; it is indeed a “palace built for her [the divine spirit of Shekinah], namely a sanctuary for her holiness, sanctified and inscribed with all the inscriptions of the supernal sanctuary” (Sepher ha-Temunah). Should a tarot deck work with Jewish themes? None other than the great Kabbalist and mystic Abulafia wrote “know that most of the visions of which Raziel saw are based on the Name of God and its gnosis” and scholar Gershom Scholem continues, “the identity of prophecy with the love of God also finds its proof in the mysticism of numbers” (Major Trends in Jewish Mysticism, p. 138). Rachel points out that divination does indeed come from the divine, and prophecy is an essential if occluded element of Jewish myth. The story-telling element of both Judaism and the tarot is merged together and emphasized in Rachel’s text accompanying the deck. This provides ample opportunity for the reader to explore the midrash, or narrative, of the process of spiritual development through the kabbalistic framework naturally underpinning the deck. This kabbalah is woven lightly but powerfully through Robert’s illustrations and is an ideal gateway into the avenues and orchards of that profound subject. A final note that Robert’s artwork again meets the challenge of presenting the most enigmatic of concepts in the most accessible manner; his World card, illustrating not only the “Bride of the Earth” but also “the King” with whom she is united, is a triumph of illustration. Authors; The Magister, The Magician’s Kabbalah, Secrets of the Waite-Smith Tarot, Abiding in the Sanctuary. In a recent discussion with Rachel Pollack about inspiration, I suggested that we look at the etymology of the word. From Latin, inspirare, to be inspirited or to inspire, inspiration means not only ‘to breathe,’ but also to receive divine guidance when breathing in a certain way. What is thus suggested in this word is the idea that there is a breath that is transcendent. For me, then, any inspired kind of breathing is akin to a heroic act that reminds me of my first kiss. Today I’ve asked this inspired work of divination, illustrated by Robert Place, to tell me something about the meaning of inspiration when it eludes the culturally conditioned categories and definitions. Inspiration is a thing of the night, when we get a sense of how we can deal with both, powerful friends or powerful enemies. At first I was intrigued by this sequence ending with the Mountain, a card that spells out something insurmountable, or an obstacle. But then, going back to the etymology of the word inspiration, I was reminded that the Mountain, quite literally, is something that can take our breath away, for better or worse. A mighty sight from the top of a mountain can leave us in awe. If you climb a tall mountain, you will have a breathing problem at the top. You become aware of how precious is the air that you inhale and share with others. 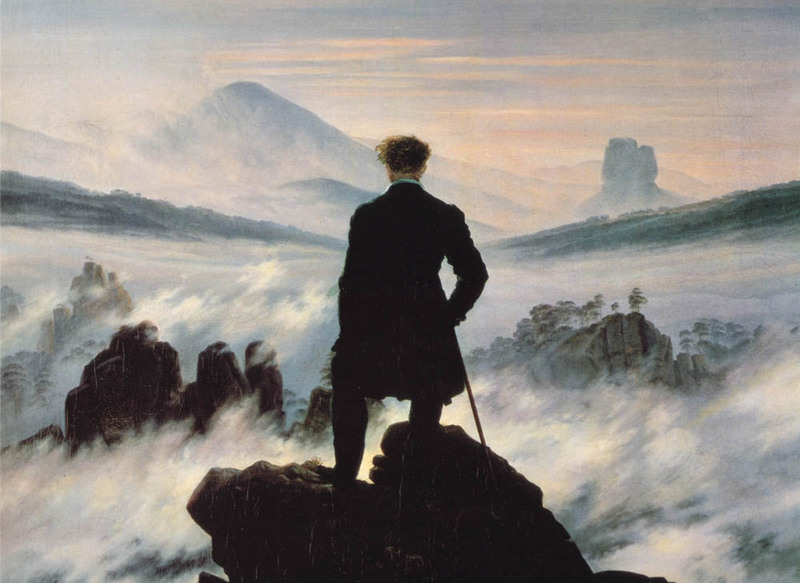 For all the Romantic imagery of the conqueror on top of the mountain, the truth of the mountain is that it teaches us little about solitude and a lot about connections. Solitude is never as inspiring as sharing is. But then, with sharing also comes potential trouble. Not everyone is either ready to receive what you have to give, or simply to give a damn. This latter situation often has various causes, ranging from indifference to envy or jealousy, and while we can safely conclude that indifference is not very inspiring, hatred definitely is. If we are the recipients of hatred, we can get inspired to rise above the situation and get on with our own program. If we get caught in the act of hatred ourselves, we can be inspired to do the same, rise above, or simply devise strategies that will put some sticks into the other’s wheels. Regardless of which camp we happen to be in, chances are that we will know what to do about our predicament – though some may rightly argue that hatred is often blinding, in which case knowing what to do will not be in the picture. What I appreciate in Rachel’s new book is precisely her sensibility about what makes people uneasy. She describes with great care old and tried interpretations of the cards in juxtaposition with more contemporary views. The book is thus a feast of synthetic thinking, and of ways of essentializing opposing discourses. Although the subtitle of the book heralds the book as an oracle for the soul, there is a lot of ‘traditional’ Lenormand in it. It is also quite clear that Rachel moves with ease between showing her preferences for either the traditional take on a card or a modern interpretation, all according to what she finds relevant to discuss. This is always a sign of great mastery over acts of interpretation, namely to know how to fearlessly hit the target, all according to what is useful and necessary, rather than according to what is deemed dogmatically traditional. 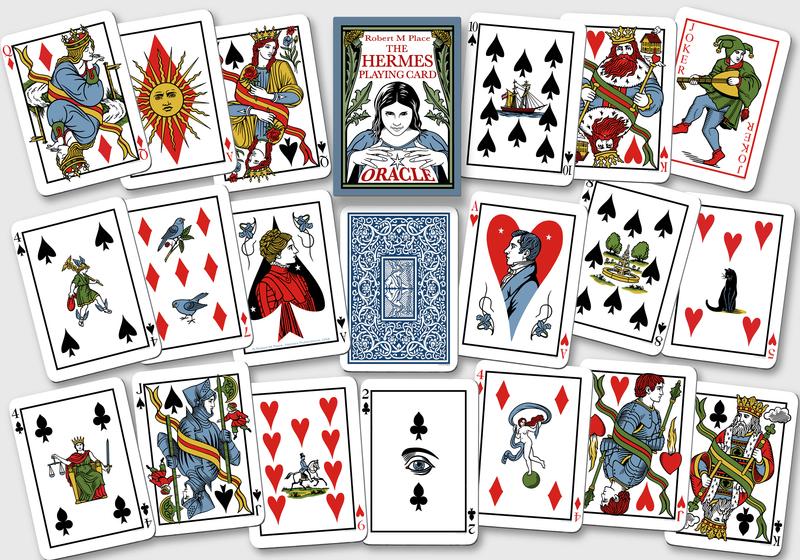 The cards themselves are more modern than traditional in their aesthetic imagery, and they don’t feature a playing-card inset – which I prefer for my Lenormand cards. They also have a size that’s not entirely suitable to readings with the full deck. But as I like a challenge, I want to offer here a novel take on how to read a grand tableau based on working with the idea that a 3-card sequence gives us to begin with. I have to admit that since the grand tableau excites me the most when I read with the Lenormand cards, I consider it my specialty. Hence, no matter what cards I happen upon, the first thing that I do is lay them all down on the table. Here’s the method: Remember that the question was one about definition. What IS inspiration? Now, the idea is to put the first three cards that gave us an answer back into the deck, shuffle again, and then place them all on the table. 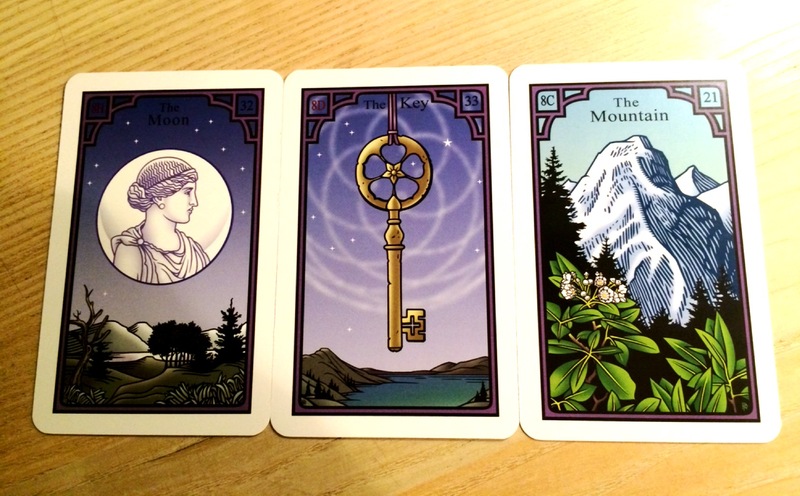 You will be looking at the interaction between the three cards, in my case here, the Moon, the Key, and the Mountain. What you want specifically is to see how these cards fall into their respective houses (in my practice I always follow a variant of the Master Method), and what they tell you about the nature of the thing you inquire about. This method is not so much about getting an answer – as you got one already – but to learn more about the underlying structure of what is at stake in your question. Since we also operate here with significators, you may want to see yourself as a player vis-à-vis these cards, but this is only a requirement if agency becomes an issue. In our case here, for example, the potential problem of going from focusing on the idea of ‘inspiration’ and how we unfold the ways in which we come to define it, to the idea of embodiment: Who is inspired? Why? And what will one do with this inspiration? 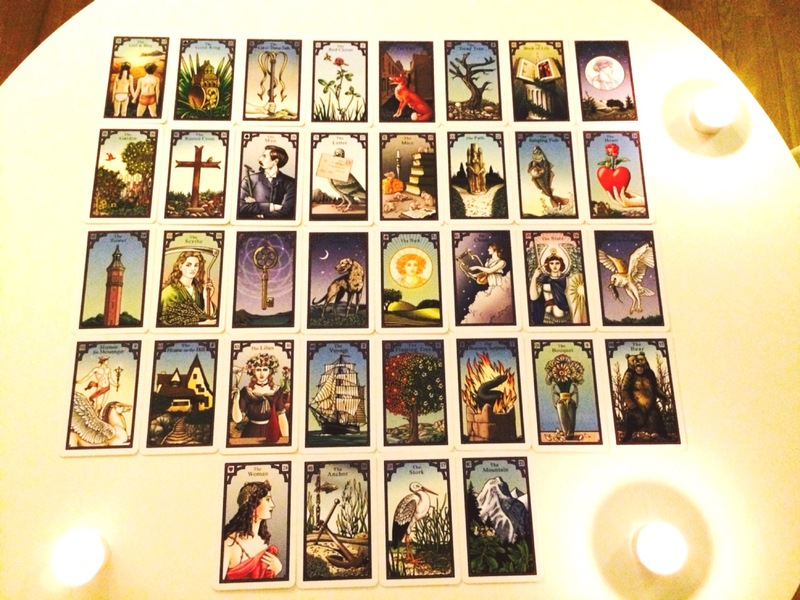 Looking at this tableau, what strikes first is the position of the significator cards: The Moon in the House of Coffin, The Key in in the House of Tower, and the Mountain in the House of Cross. The immediate conclusion to draw from this is that inspiration does not carry with it the guarantee that it can move mountains. As the significator, the Woman in my case, is directly linked with two of the cards, the Key above her and the Mountain ahead of her, we must take her into account. In other words, we can say from the beginning that inspiration without a medium is useless. Someone has to actually breathe in order for inspiration to happen. Fair enough. This obvious observation seems to support the very etymology of the word we started out with. Thus we can say here that when in an inspired mode, you can be sure to encounter opposition, conflicting views, or resistance to the solutions you may have to offer. Just think of prophets. When was the last time you’ve heard of one who was appreciated in her country? The Mountain as the last card is quite significant in this context. Above it we have Rachel’s title card, the burning Serpent itself, thus enforcing the more traditional meaning of the Mountain as enemy. With the Snake in the House of Lily above the Mountain, you can expect nothing but slander and disgrace from your enemies, the house of the Lily being associate with just that, a fall from grace. The nature of inspiration, then, is to say that it provokes. In her rendition of the Mountain card I appreciated Rachel’s preference for this early meaning of the card to mean ‘enemy’, a meaning that is not dissolved into the more modern, yet abstract idea of ‘obstacle’. An enemy is a tangible thing. Plenty of them around, if we care to look, or if we care to see past our desire to ignore the idea that others may find our inspiration insufferable. In contrast, the ambiguity of inspiration, as something we cannot always find words to describe, is further suggested in the Moon card, now in the House of Coffin, a house dealing with ungratefulness, and, according to Papus, envy. Inspiration is often enviable, so again we are led to consider some of the more negative associations with the idea of inspiration than we care to admit exist. We tend to think of inspiration as a mighty force, indeed the force that is capable of reminding us of primary passions, but it’s clear that when inspiration is embodied, it becomes subject to scrutiny, it stirs the passions. However, as we already know, some of these passions are not always of the highest order. Moreover, inspiration always plays against the background of norm. Who sets the norm for what is (in)appropriate, culturally (in)admissible, or simply the norm for what is disturbing? A really good idea, a Key idea, needs consecration from the ivory Tower in order to get disseminated, but at the same time, it also has the potential to rock the boat of the establishment. The Moon card makes an aspect to the Rider, here depicted as Mercury in the House of Ring associated with kindness. There’s emotional passion in this bond. Inspiration clearly comes riding fast and has a lot to say about new liaisons. An inspired solution, while often corrective, can also prove to be the right one, as the Key here indicates, what with the Whip above it and the Lily below it. So the nature of inspiration is to create decent connections. A lot more could be said, and I’d gladly launch into details, but suffice it to say that this method of first divining for a question with 3 cards, which you then place in the context of a grand tableau, has the advantage of ‘nailing’ the issue at hand. There is no way you can be in doubt as to what’s what, and if it is a definition you’re looking for, then you can be certain to get a very clear answer. All you need is a bit of inspiration – which card breathes first? – a method to process this inspiration so it becomes solid knowledge, and determination. See that Woman there, next to the Anchor? She is it. Perhaps, inspiration is ultimately also of the nature of elevation, even when it happens to fall into ill conditions. This tableau, then, says that when inspiration is embodied, it IS about heroic acts: Acts of moving a mountain, because even if you don’t think you can, you can still imagine a big Bear standing on top of it, saluting you, and telling you that it’s all a puff. Thanks to Rachel for her thoughtful ideas in our conversations, on and off the record and in and out of the public eye, and for her considerate gift here. 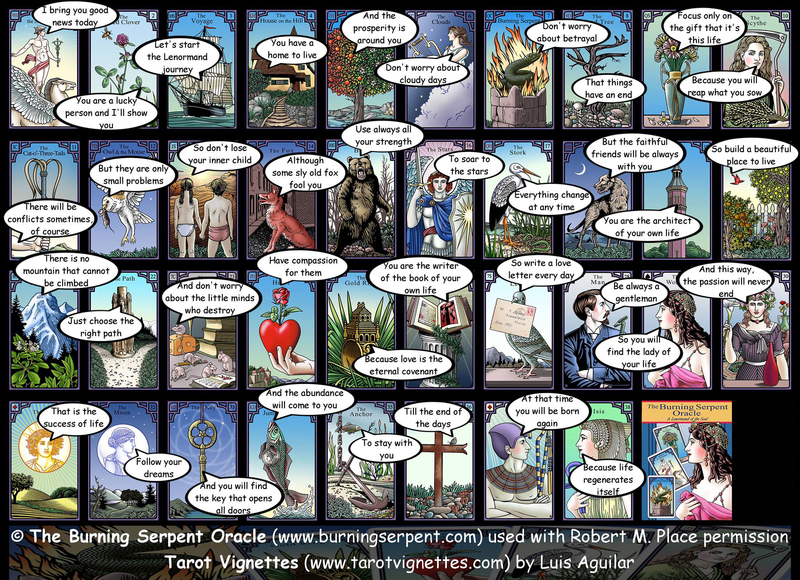 The Burning Serpent Oracle: A Lenormand of the Soul. 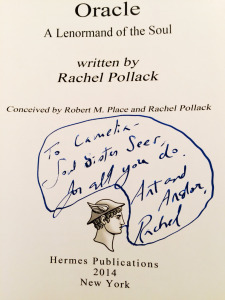 Robert M. Place (illustrator) and Rachel Pollack (writer). New York: Hermes Publications, 2014.